Hi everyone, hope you all are doing well. I really feel sorry for taking a long break from blogging . We went to India for a month in February and it took couple of weeks to settle down after returning back to San Diego. I promise that you will see more regular posts from me now onwards. Last week Indians all over the world celebrated the festival of colors called Holi. We too followed the tradition in our neighborhood park and I had the responsibility of bringing sweets for all. 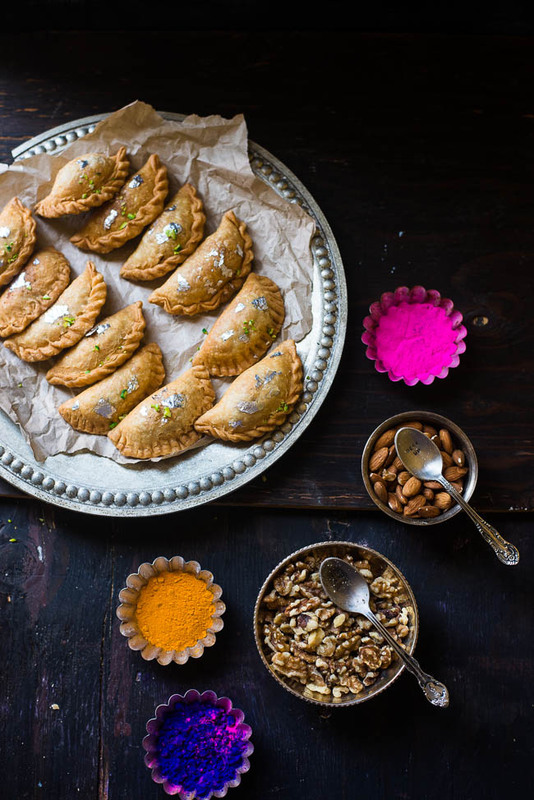 So I started looking for recipes that are appropriate in this occasion and generally prepared in northern part of India where Holy is the most popular festival. I could find one such sweet dish called Gujiya that made all my neighbors delighted, including some non-Indians. Today I will share the recipe of this sweet snacks. 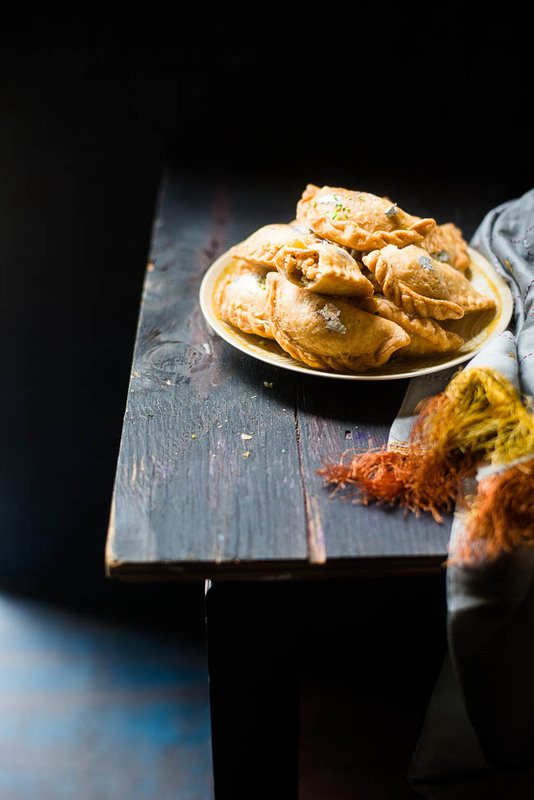 Gujiya is a deep fried pastry with the shape of a half-moon. 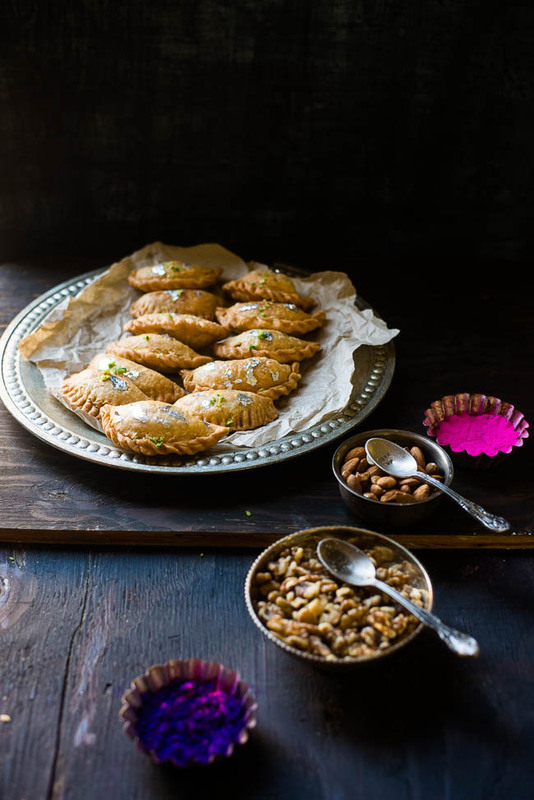 In this golden brown colored sweet, crust is filled with a mixture of khoya, coconut, nuts and roasted dry fruits. Khoya in Hindi means milk solids. After returning from India, I was bit lazy to visit the Indian grocery store. But to my surprise, all the ingredients were available in my pantry. 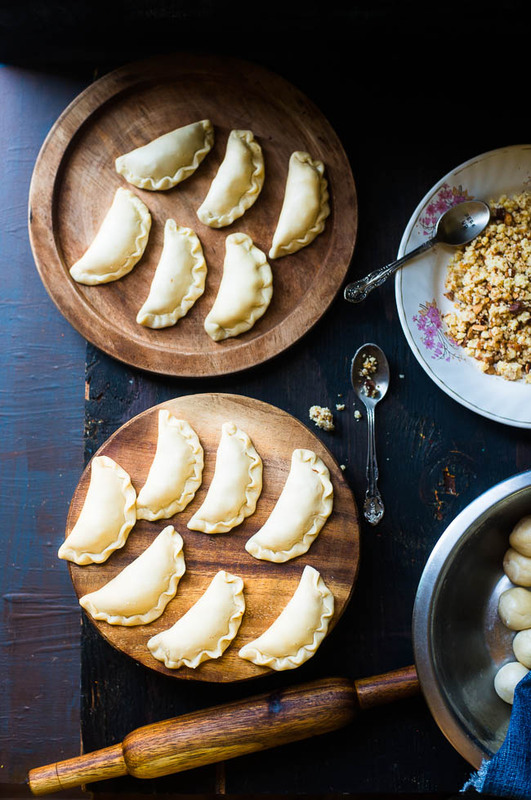 Though the preparation of Gujiya requires little time and efforts, it’s not that hard as I initially thought and the taste of this delicious dish is worth the effort. 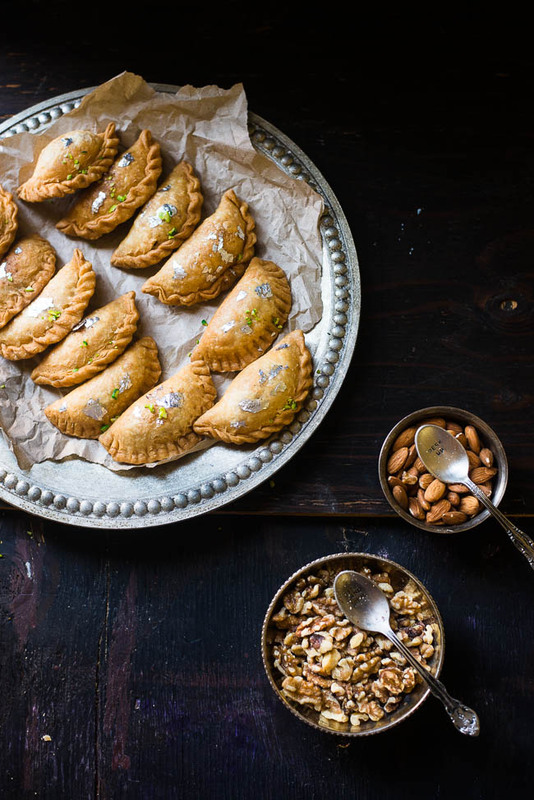 It’s interesting that Gujiya is not only popular in Hindi speaking belt of India, but equally favorite to the people in other parts of India. Only difference is the filling and the name. It’s called Karanji in Maharashtra and Karjikayi in Karnataka, both are similar deep dumplings made of flour and stuffed with dry coconut. 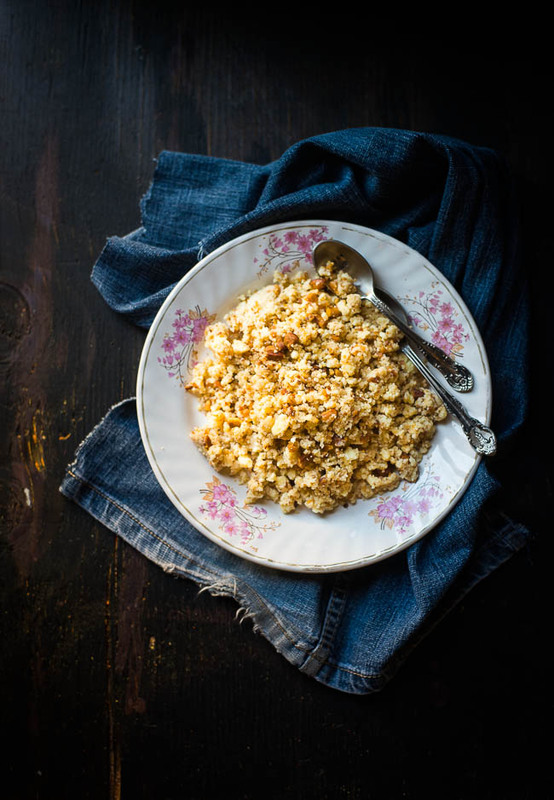 So if you are in search of making something special for your loved ones and ready to put some effort, go for this recipe without any hesitation. 1. Take a big mixing bowl add the flour to it. Add ghee to flour and mix it nicely with your hand. Add sugar and mix it again. Add cold water to the flour mixture, add little at a time and knead it into a stiff dough. Cover the dough with a damp kitchen towel and keep it into the refrigerator for an hour. 2. Take a non-stick pan, add the nuts and heat it up. Stir it until they are slightly roasted. Take it off from the heat and coarsely chop the nuts. Now add the khoya in the pan and saute for couple of minutes. Add the roasted, chopped nuts and add the powdered sugar. Mix it nicely. Now filling is ready, set it aside. 4. Place about 1 tablespoon Khoya filling in the middle of the circle, keeping the edges empty. Now carefully bring the edges together and gently press the edges to seal. Pinch the edges to make a design or use a fork to make an easy design. 6. Drain gujias on kitchen towel to absorb the excess oil. Once they are completely cold, serve it or store it in an airtight container. Welcome back...you were missed...I can't get over the gorgeous colors in your brilliant photos! Happy feasting.